The world’s only double para team of Brian Cowie and Meyrick Jones recently competed in the prestigious Escape from Alcatraz triathlon. Since 2009, Brian, a visually impaired athlete and Meyrick, a below-knee amputee, have teamed up to form one of sport’s most inspirational and unique partnerships.Swimming in the choppy, cold water from Alcatraz Island to the San Francisco shoreline, and then running and cycling along the hilly coast makes for a challenging triathlon—never mind that this was the first time Meyrick has been back in San Francisco since the freak cable car crash that took his leg 20 years ago. We had a chance to talk to Brian and Meyrick about this race, their motivation and how they continue to fuel their better. Vega: Escape from Alcatraz was obviously a very significant race for you two. How did race day go? Meyrick: Race day went really well! The swim was a good challenge—no buoys, currents, chop, chilly water... the bike was a lot of fun—all ups, downs, lefts and rights—never a dull moment. The run was more of a trail run with sand sections, gravel sections and plenty of stairs. The unique course really made the time fly by. Escape from Alcatraz is such a cool race. It’s iconic in the sport of triathlon and was definitely a bucket list race for us both. Just a really beautiful course. Meyrick: The swim was the hardest part—no buoys to follow. You have to pick your own route back to mainland. It’s cold and it’s choppy. Brian: The swim is always a little bit stressful, with so many people climbing on top of us. For this race, the run was actually the most challenging for me. It was very technical—constantly changing terrains. Meyrick had to guide me through steps, roots, ditches, holes, and rocks. Vega: How do you fuel a race like this? 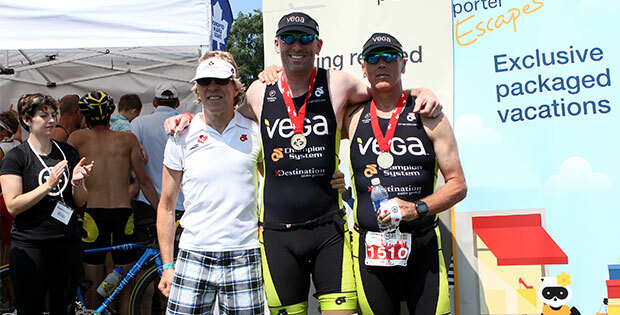 Brian: I had Vega Sport Pre-Workout Energizer before the race, 2 Vega Sport Endurance Gels mid-race, and Vega Sport Recovery Accelerator and Performance Protein post-race. Vega: What keeps you motivated during challenging races like Escape from Alcatraz? Brian: There’s both individual and team motivation. I’ve been doing this for so long that I don’t know how to stop. It’s such an individual sport and I was doing it for so long alone, it’s nice to turn it into a team sport. We have a good time. It’s not stressful for us like it is for a lot of people; we’re enjoying ourselves the entire time—before, during and after. Meyrick: I like how doing these types of events makes me feel. I feel alive. I’m challenging myself and I’m doing something valuable. After years of racing on my own, and lots of races, it started to feel... ho hum... It was missing something and maybe I was looking for a new challenge. The team aspect of racing with Brian adds a lot – It’s rewarding to help someone, but the main thing is that we have a blast racing, and it has added a bunch of new elements to the sport for me. We have stories to tell of the highs and lows—races we’ve conquered and a few that conquered us… The fact that he and I can inspire others with our racing is such a gift. Vega: What races are still on your bucket list? Brian: There are many other races to do. I could think of about 50 off the top of my head...Wildflower, Kona, more Ironman races... There are a lot of cool races to do. Probably more than I can do in my life. Meyrick: I also want to do the World Marathon Majors. I did the Boston Marathon this year, and we’re doing the New York Marathon later this year. Which leaves Chicago, Berlin, London and Tokyo. Brian: We’ve got a long list of events each year – we love racing. Our next event is the ITU Race in Chicago at the end of June, and then we’ll definitely be doing the Toronto triathlon in July and a few GranFondos later in the summer and fall. Vega: You two are a huge inspiration as athletes, but you’re also constantly giving back with Paraproject—how can Vega blog readers support you? Meyrick: ParaProject is supporting people by giving grants to para athletes who are experiencing a financial obstacle in getting the right equipment, training and transportation. Athletes submit an application for funding and the Paraproject committee chooses the most worthy applicants to receive grants. Brian and I are fortunate to receive some corporate support, like the support we got from Vega, which helps us to spread the word. The Paraproject has its own donors and corporate support –the two types of funding never get mixed. If you donate to ParaProject, your money goes to other athletes. We support ourselves. Brian: Plain and simple: donate.